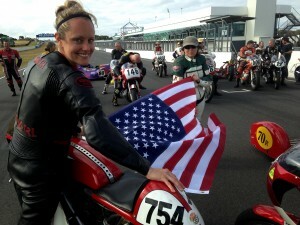 Team USA at the Phillip Island Classic! 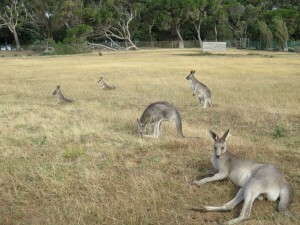 Phillip Island, Australia – It is late January, summertime here in Australia. 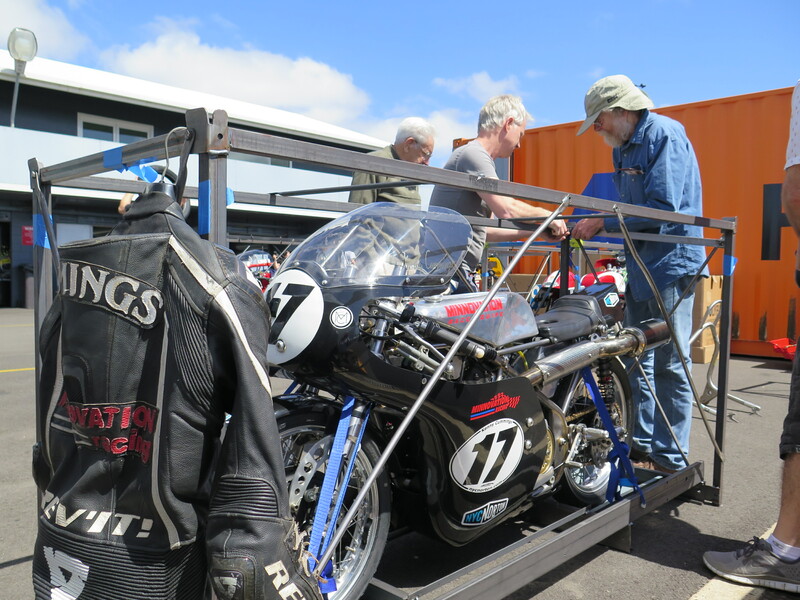 Arriving in Melbourne for the first time, two days before the 21st International Island Classic Australian Motorcycle News race weekend. 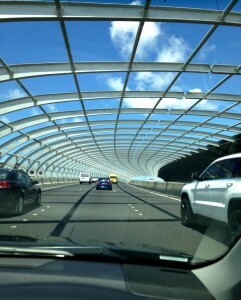 I make friends with “Jane” my GPS who routes me thru Melbourne. I marvel at its size and modernity. 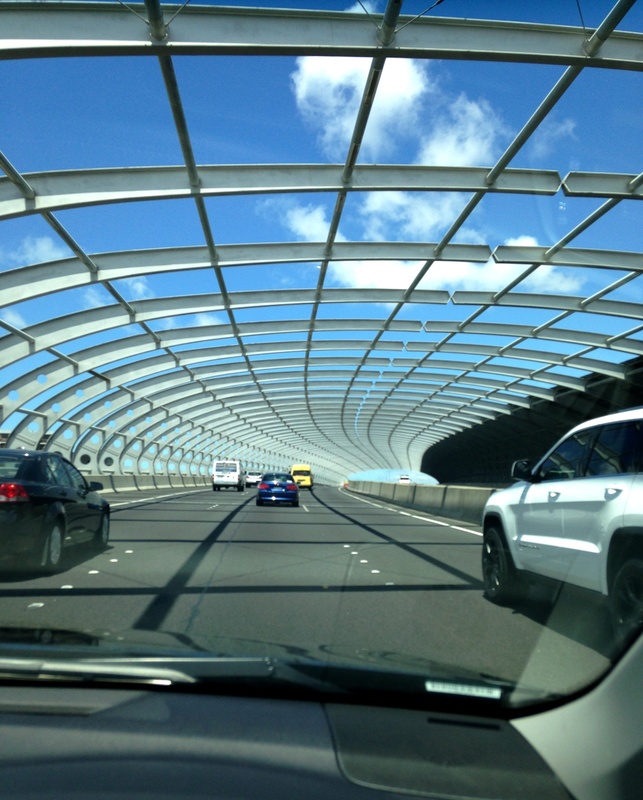 Jane directs me south bound, leaving Melbourne over the Seafarer’s cable suspension bridge. I get distracted by the spectacular Port Phillip Bay view. It is also my first time right side on a public road, “keep left” I remember. 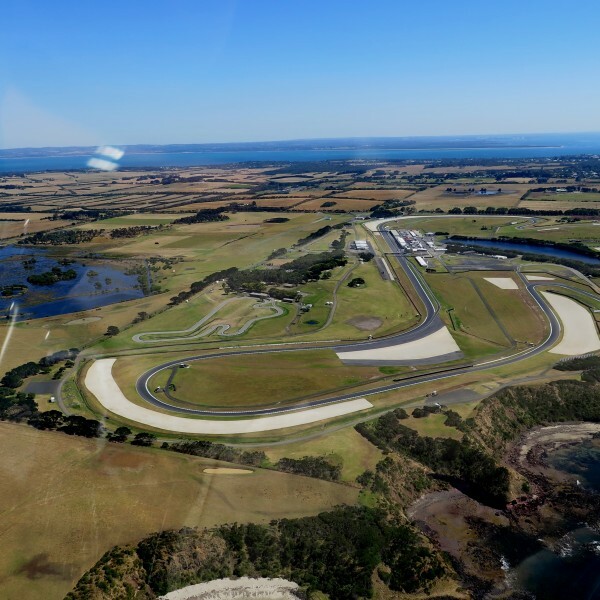 Destination Phillip Island International race track, it is 90 minutes away. Fun things along the Southern coastline. I discover a working dairy farm, the Caldermeade Farm and Cafe offering a nice home style lunch and something called a “flat white” coffee drink. An Australian version of what we know in the U.S. as a latte. The difference being that only “microfoam” is used. This foam is found in the middle of the beaker when steaming milk. It is velvety smooth in texture and poured over a double-shot of espresso. Afterwards I continue on and see signs for local wineries. Wine? Curious, I turn off the highway. 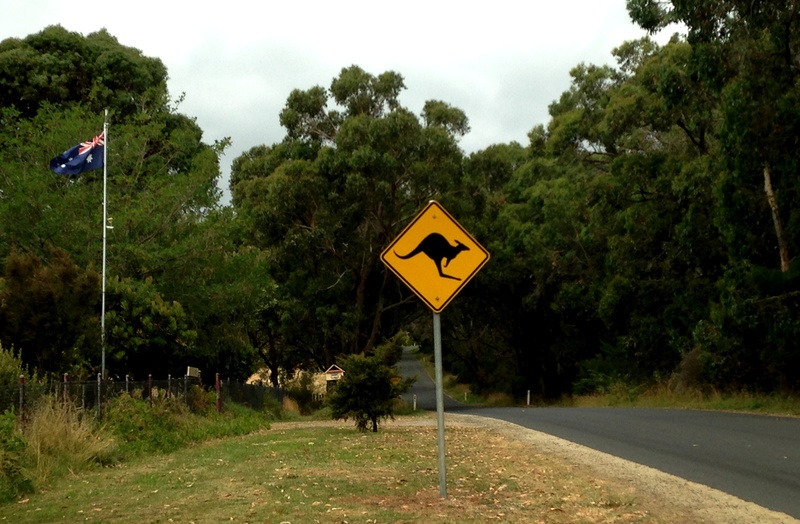 In less than 4 km I see my first kangaroo crossing sign. 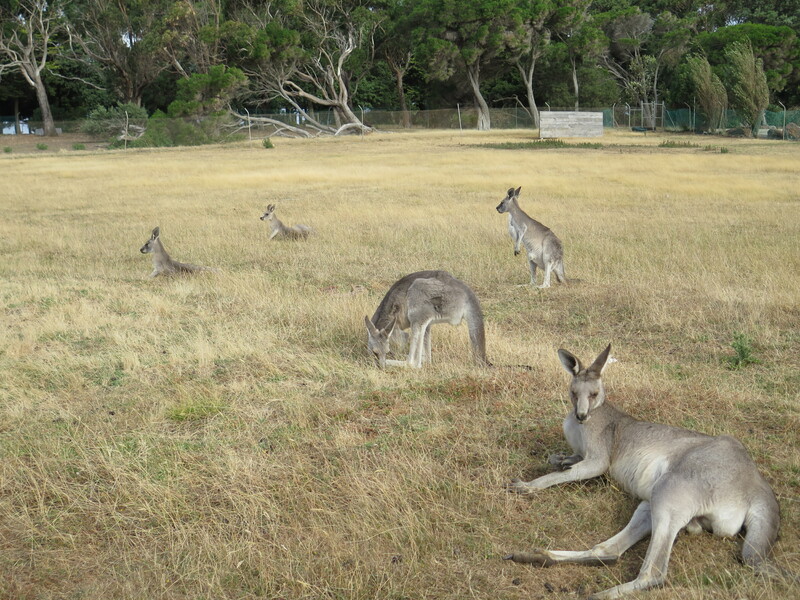 A reality check, I really am in Australia. My eyes now constantly scanning the wooded roadside for any signs of the famous “roos”. Sadly, I find only horses. Australian countryside is much like California wine country. I wind my way up the narrow country roads canopied by ancient shade trees. The hillside backdrops are golden-colored grass fields dotted with cattle. I pull into one of the wineries high on a hilltop, Bass Valley Vineyards. 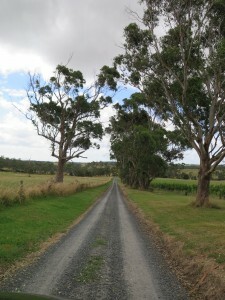 It is someone’s house, typical in Australia of the small local wineries. 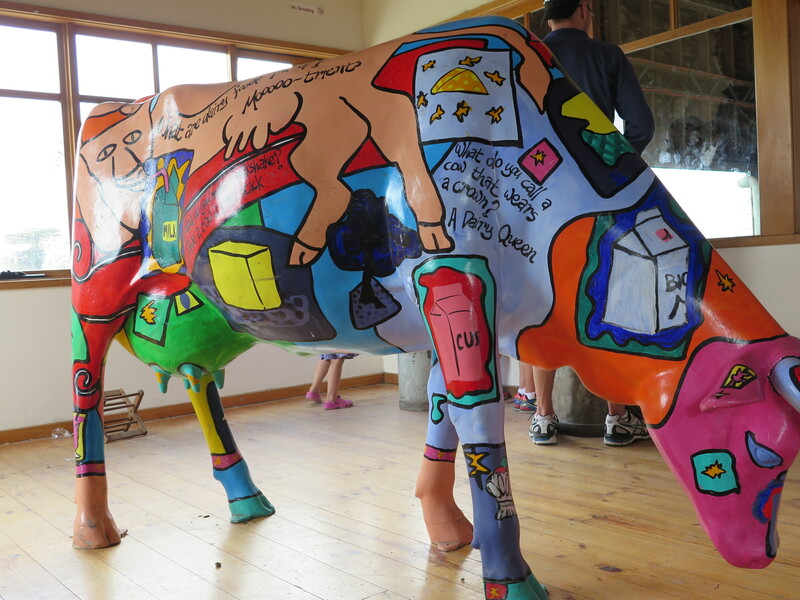 The back of the property has a small tasting room, a converted milking shed. I take a seat at the long bar. 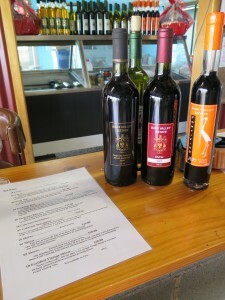 I am told about the helicopter rides from Phillip Island offer tasting tours to these local hillside wineries. 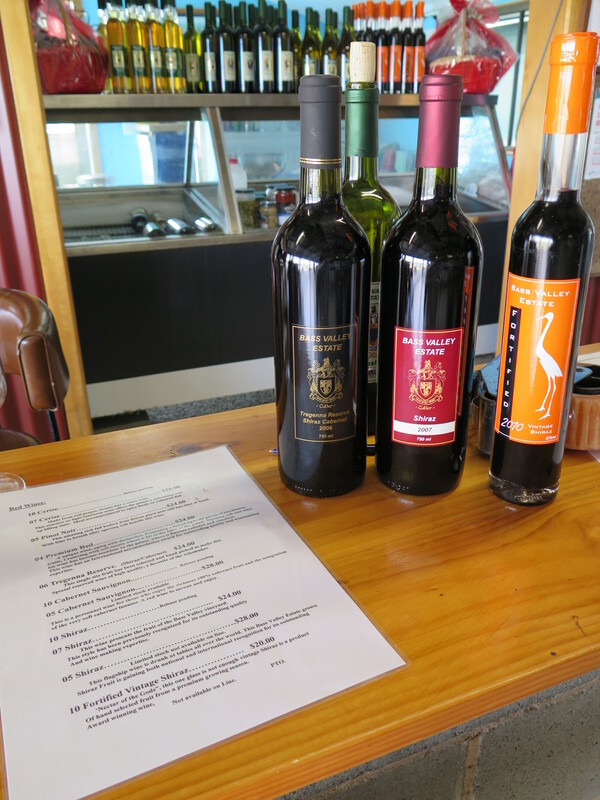 Sounds like fun I think as I taste the local Shiraz and Cabernet. There is Riesling also available if you like whites and something called “Fortified Shiraz” which is Australian for “port”. I take a couple of bottles to go and head to the track. 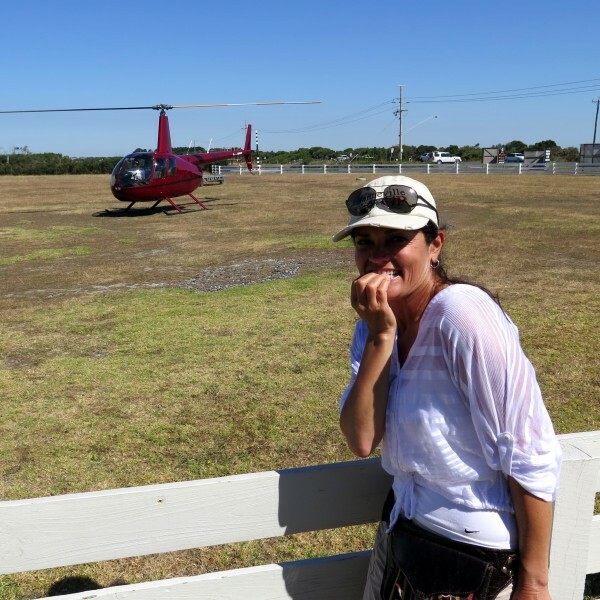 An adrenaline junkie’s dream! The track is easily seen from the road. I pull over to soak it in. It is vast and contradictory. 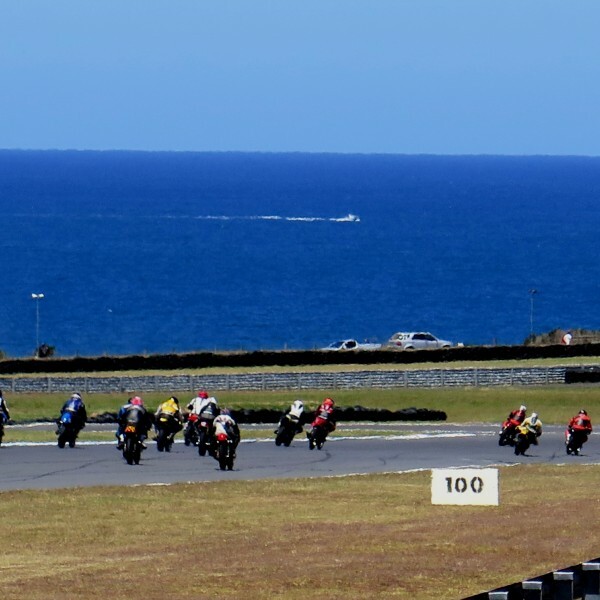 One does not associate alluring azure blue oceans with 200 mph fantastically fast motorcycle racing. 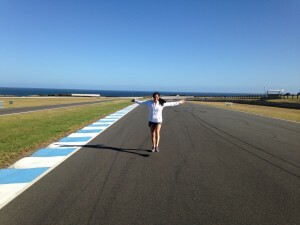 The illusion is that of an infinity pool flowing off the track from Turn One. I start to feel the little hairs on my arms stand up. Am I dreaming? Who would think to put a race track so close to the water? A group of local car and motorcycle racers in the 1950’s. Alan Brown, the track’s designer had to convince them to move it back from the cliffs! 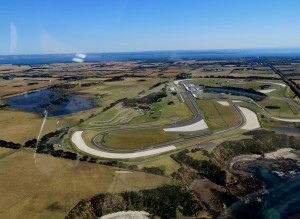 The track is high-speed with incredible grip with the $3M worth of new pavement. And Bridgestone’s nightmare! 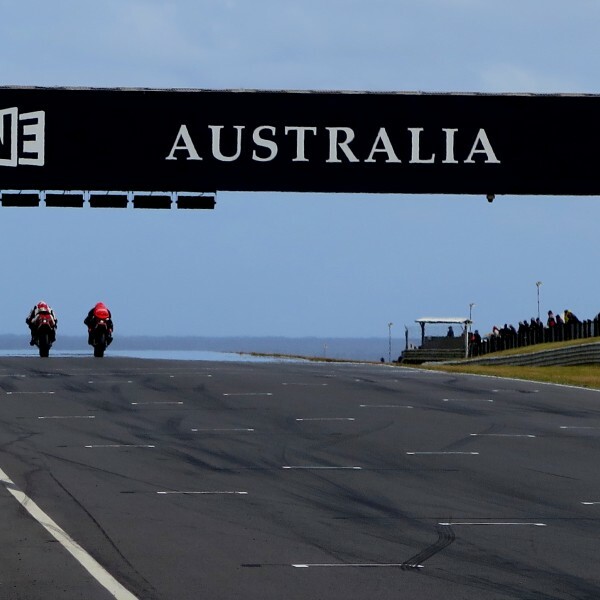 The MotoGP tire manufacturer was unable to produce a tire that could last a race. The solution, to reduce the number of laps. 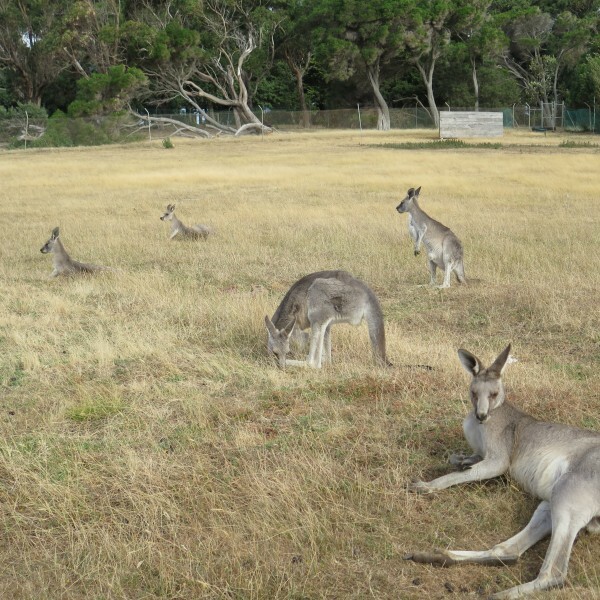 Wallabies everywhere lounging lazily in the parking lot. I go inside the track center. There is a lot to do at the track besides racing. A go-kart track, laid out the exactly the same as the race track. 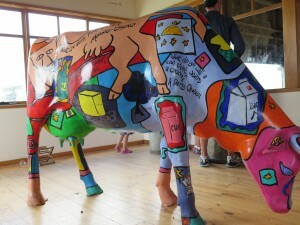 A museum, a gift shop and and a first class café serving, breakfast and lunch. Dinner is available during event weekends if the group is large enough. 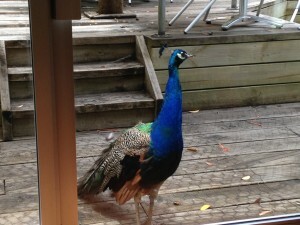 A small playground for the kids, with free roaming peacocks outside the café begging for tidbits. Wildlife? 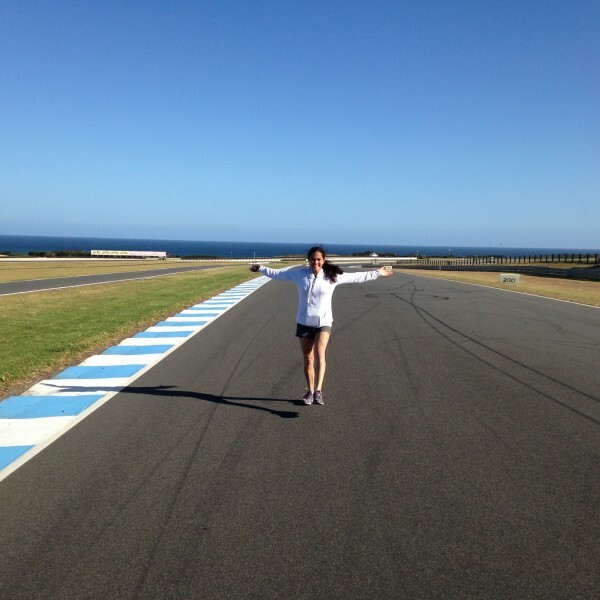 I walk the track and found that there was careful attention to drainage and plenty of run out with regards to the design. But someone forgot to warn the wildlife. Many a seagull has spent its last day here. A lone wallaby and stray geese were on the track with me. The geese are enormous. So is the goose “poop”. The size roughly of a large fat half smoked cigar. I have no doubt this would affect traction, especially if fresh. I walked the track with a local racer discussing the line. He said he had once crashed, he had run over a mouse. Well then! An almost perfect track! 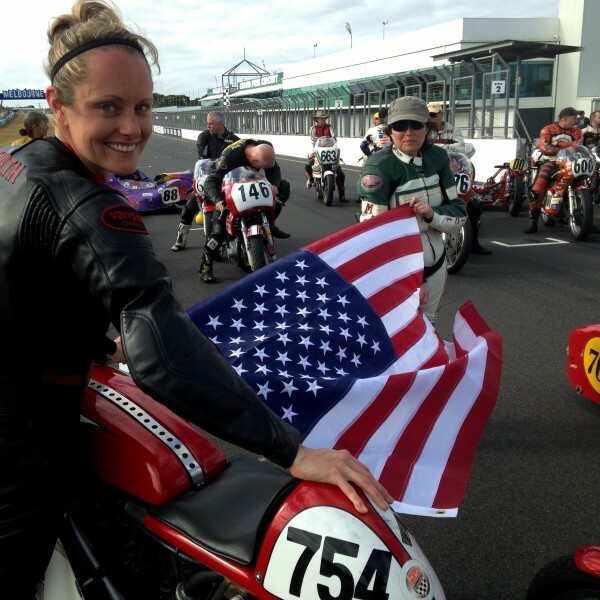 Team USA…AHRMA Racers? I came to Phillip Island for several reasons. 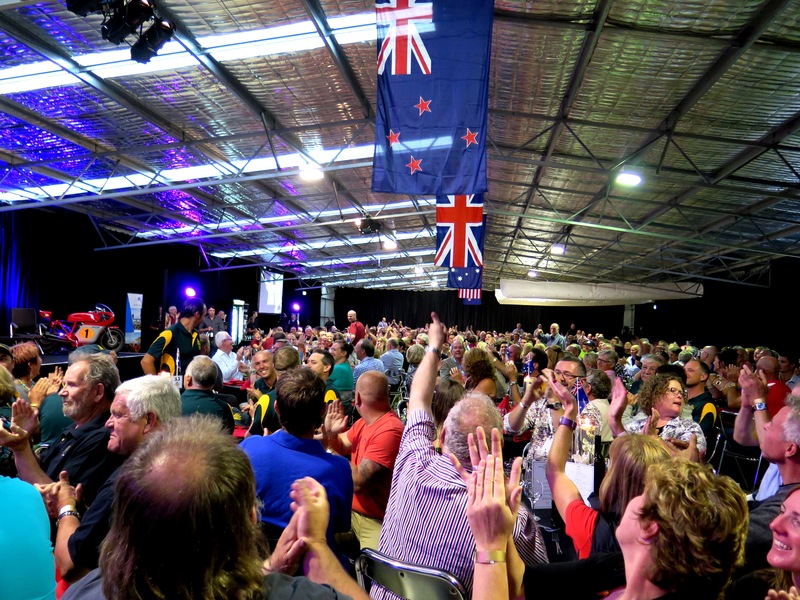 The most compelling was to find out just what is the International Island Classic? 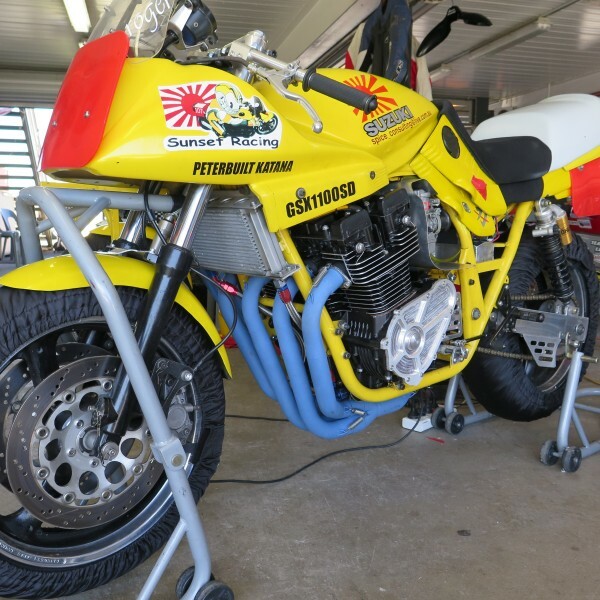 I first heard about it last year when a fellow American race mate asked me to come help him with a 1989 Suzuki 1000GS Wes Cooley, but I was unable to attend. This year, coming back from a New Zealand motorcycle tour, I get to see just what kind of racing there is, and who is it that makes up Team USA? As I walk the American pits while they unpack their bikes, I start to recognize many American amateur and retired pro’s vintage racers I have raced with nationally. 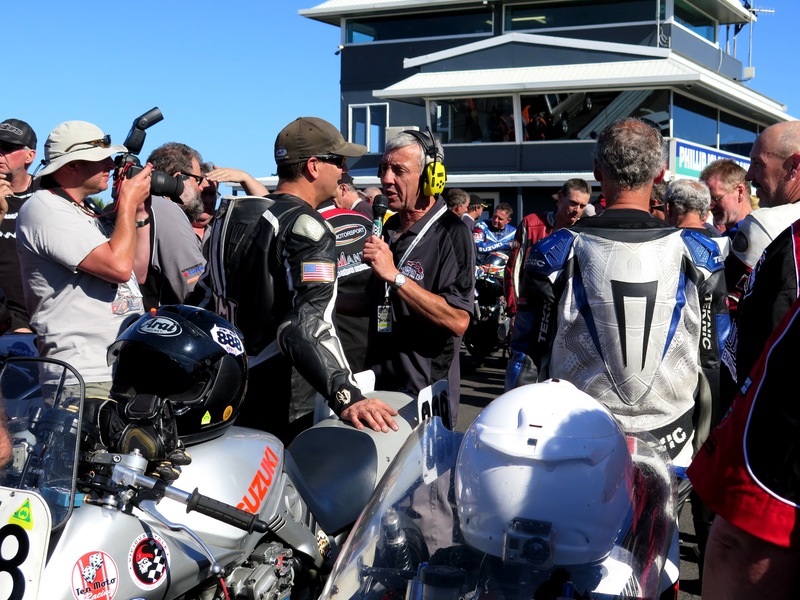 Most are members of the American Historic Racing Motorcycle Association known as “AHRMA.” Interestingly, I did not see any of our current road racing professionals as expected. I greet several and ask what the criteria was for picking the team? 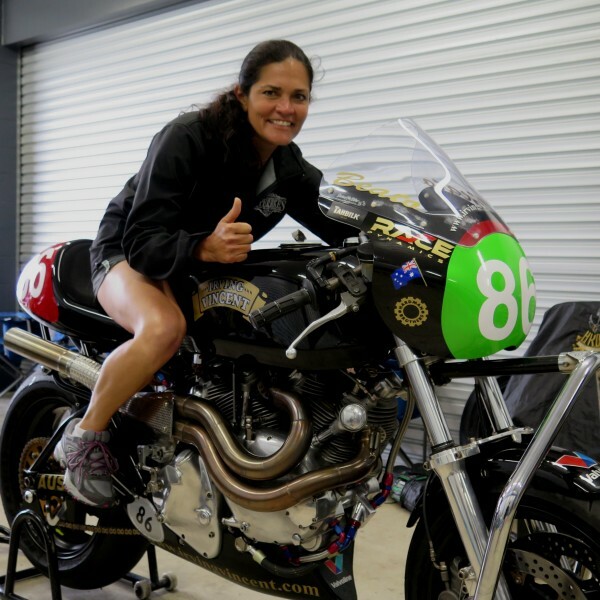 It turns out there is no qualifying to make the team and you do not have to be an AHRMA member. 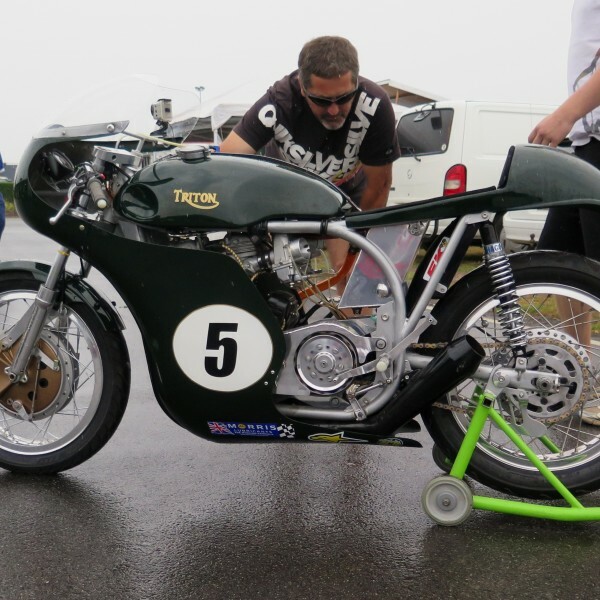 Any racer with an eligible class race bike could compete! Free bike transport for the American racers! 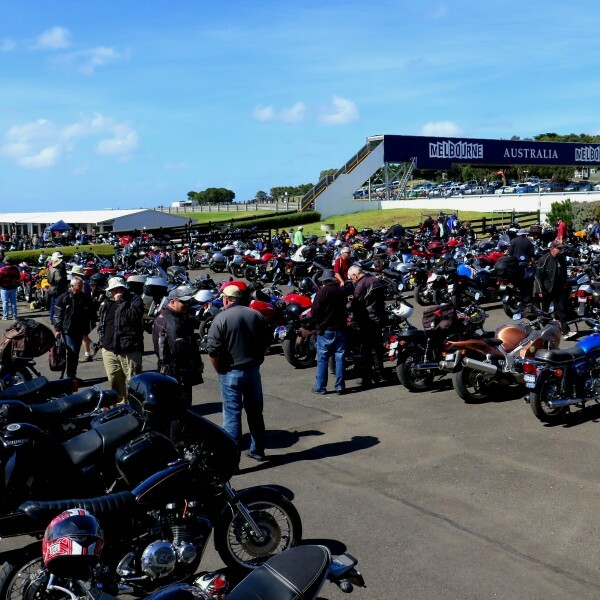 The International Island Classic’s main organizer is the magazine, Australian Motorcycle News (MCN). David Crussell, a British ex-pat Kawasaki collector of Pleasanton, California, and AHRMA member, was in charge of creating the American race team. This was his second year organizing the Americans. 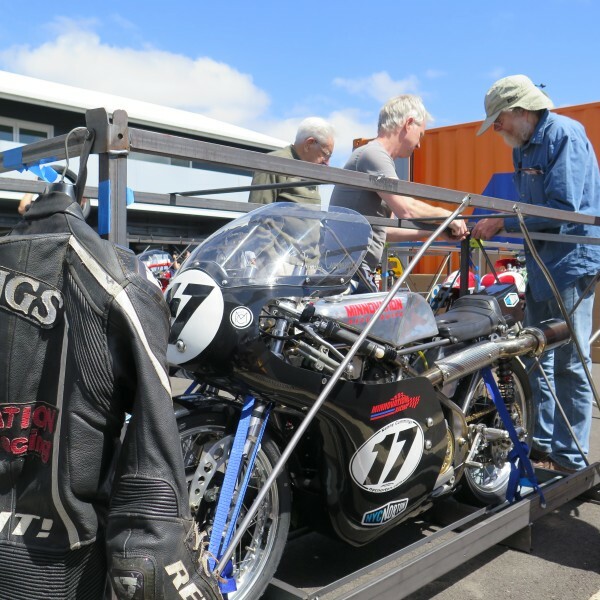 The deal… the Island Classic organization pays for the cargo container passage of the American race bikes. One from each American coast, the East and West. 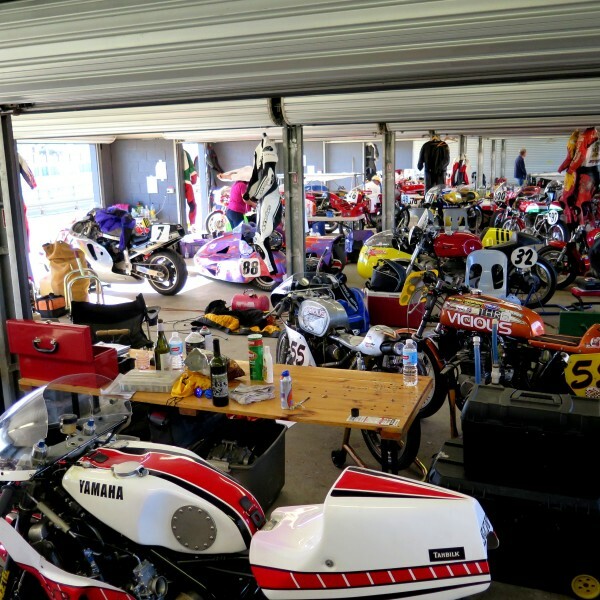 The racers pay their own airfare over, share the garages and housing. 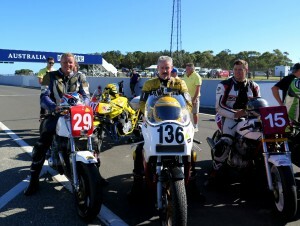 Not a bad arrangement, especially for Mr. Crussell, who brings quite a few of his own race bikes. 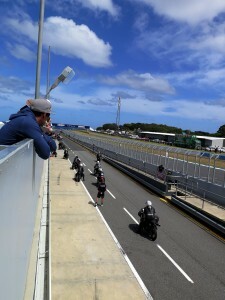 Battle between the Brits and Aussie’s. 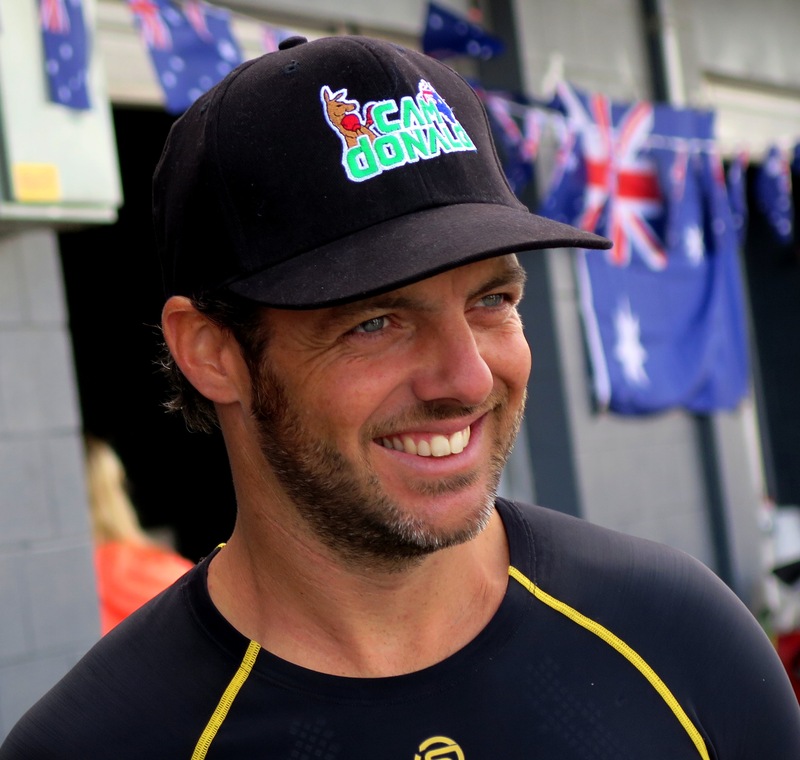 The Island Classic organizers also invited the British and New Zealanders. 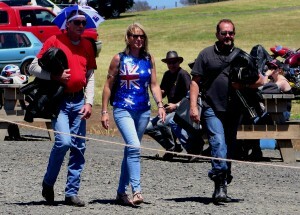 The event has been a “no joke” rivalry between the British and the Australians for many years. This is for fun racing, but very serious racing when it comes to the title events. 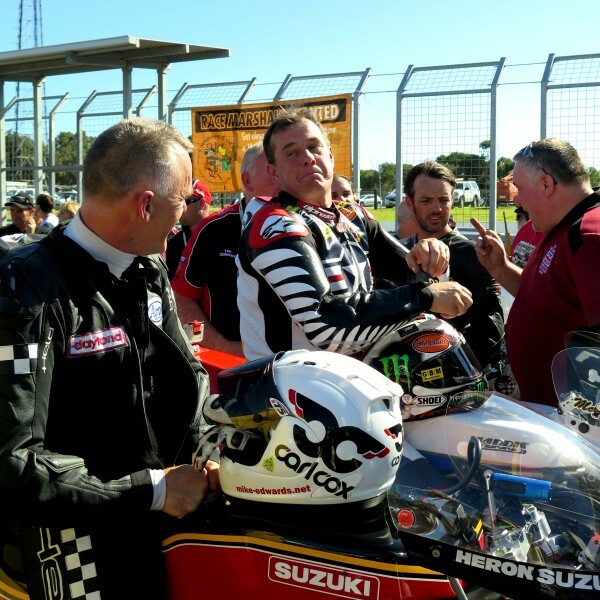 Top notch professional superstar status racers are recruited to represent the Brits and Aussie’s teams. A who’s who of Isle of Man TT racers! 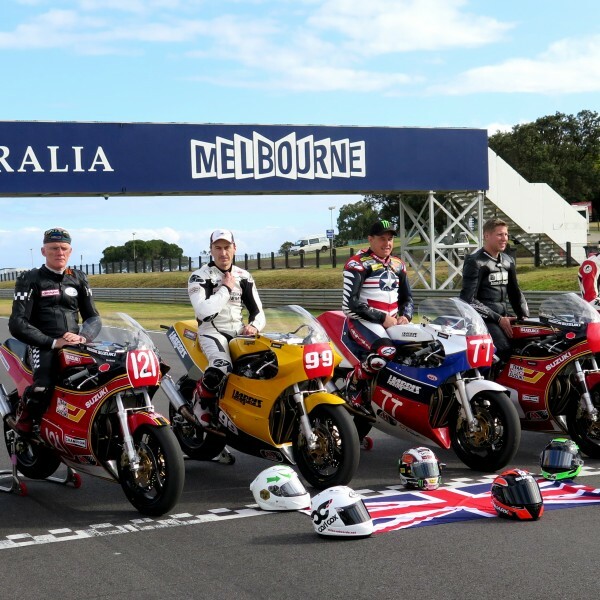 This year John McGuiness (20x TT winner), Cameron Donald, Mick Godfrey, Ryan Farquhar, Jeremy McWilliams, Shawn Giles, Beau Beaton, Steve Martin, Gary Johnson, and Brendan Roberts were just some of the all-star cast!!! 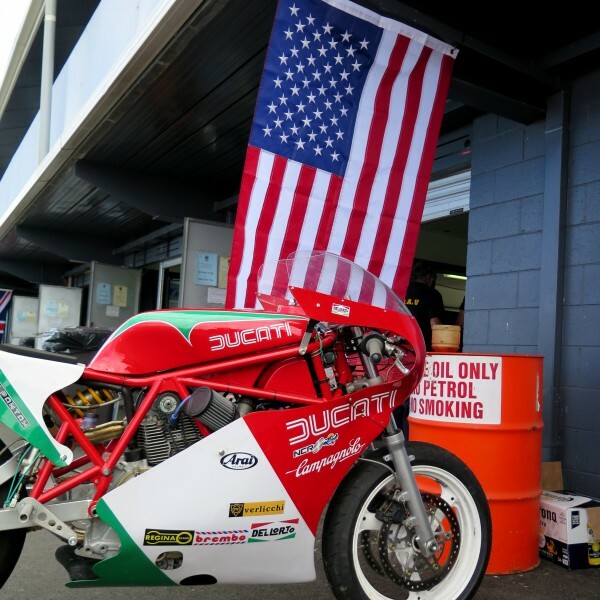 Unfortunately, this year the American racers nor their machinery came close to being competitive against the caliber of the Premier class rivals. It seems that the Yanks and the Kiwi’s are left to battle each other and invited to round out the “international” roster. I didn’t see any other countries represented, except a lone Frenchman and a Tasmanian or two?. 22 years strong. The event in it’s current form since 2005 and has grown every year since it’s start 22 years ago. It is a well-organized with an impressive and very packed paddock. 340 racers racing 490 motorcycles. The paddocks are open and accessible to the public. 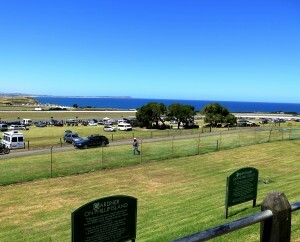 Everyone walking about the pits, sporting big grins and bright eyes, a very relaxed and friendly environment. Camping is also available at the track, reserve early. Bring sunscreen and a hat, the sun very intense here! Six Classes. I meet up with some local racers who are quick to school me about the six different classes. The classes categorized by time periods of the bikes manufacturer year. Pre-war (pre-1945) thru Period 6 (up to 1990). I walk the garages and gaze upon some really extraordinary machinery. 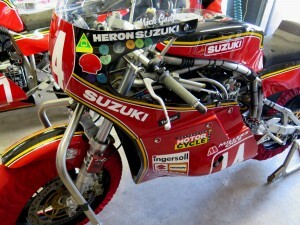 Some of “classic” bikes appeared to have modern geometry and accessories? Coincidentally, the most exotic of which, the superstar racing TT “elites” were aboard. 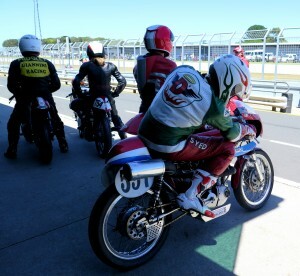 “Classic bike” is a loose term here with regard to the International Classic main race. 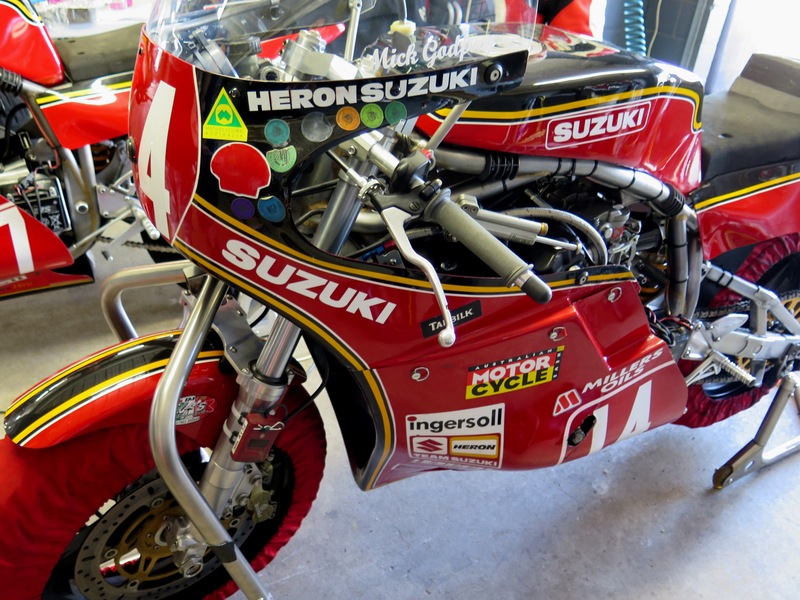 Especially the Harris framed F1 with R1 geometry ridden by Mr. McGuinness. 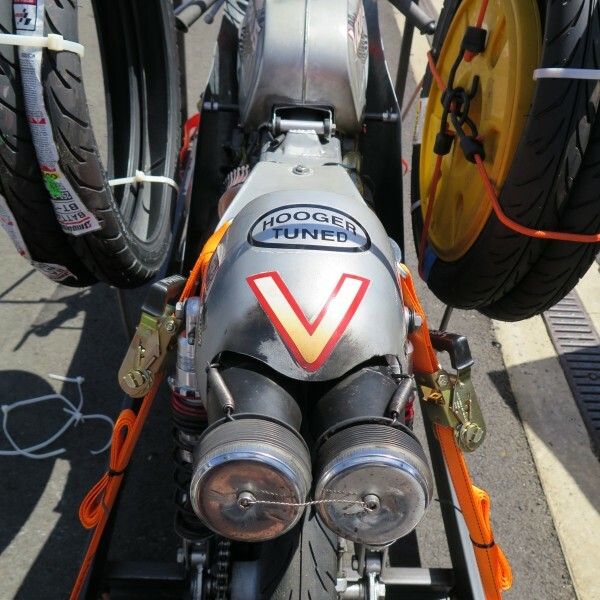 Also the Irving Vincent, a 1300cc V-Twin, which is a modern purpose-built functional work of art. 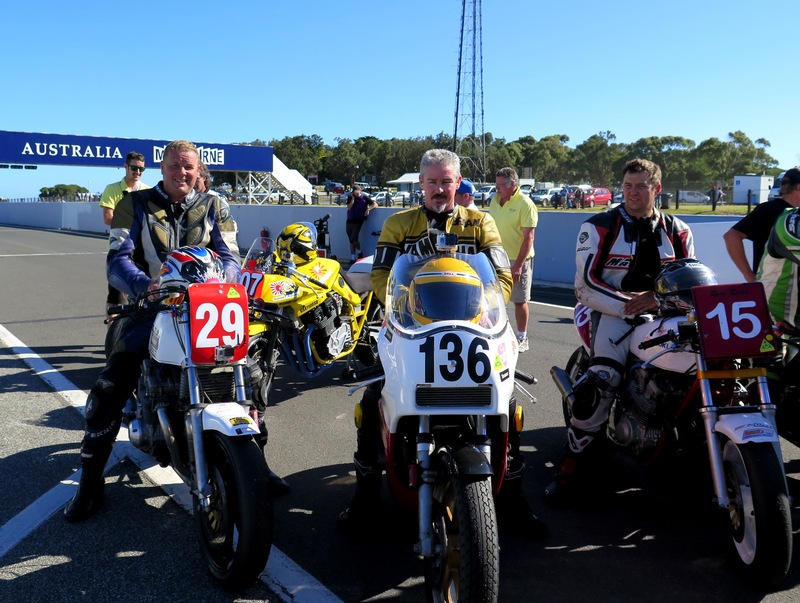 The invitation extended to tour the Irving factory in Melbourne, and learn more about these costly classic modern race bikes, the Irving is $200K bike! Bultacos, Hondas, and Yamahas. 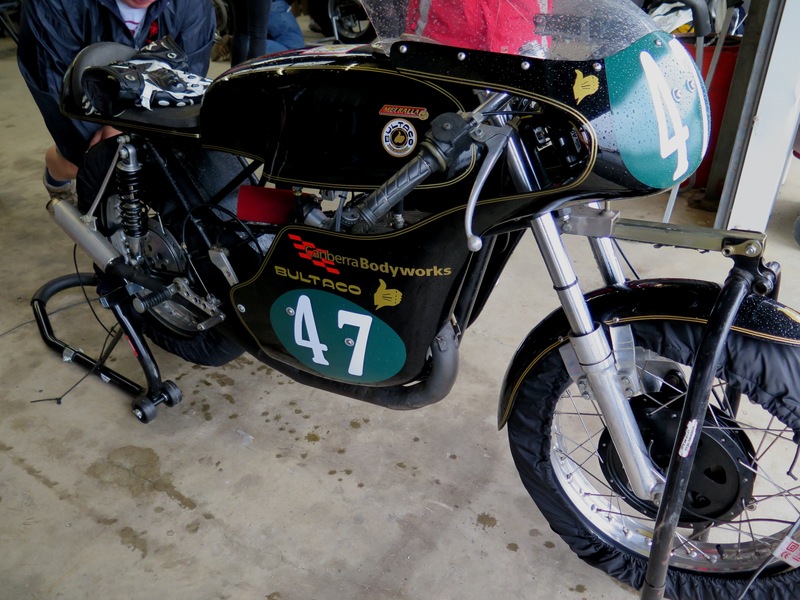 I walked all the garages and relieved to see truer versions of the classic race bikes, “every man” racers, $5-15K. 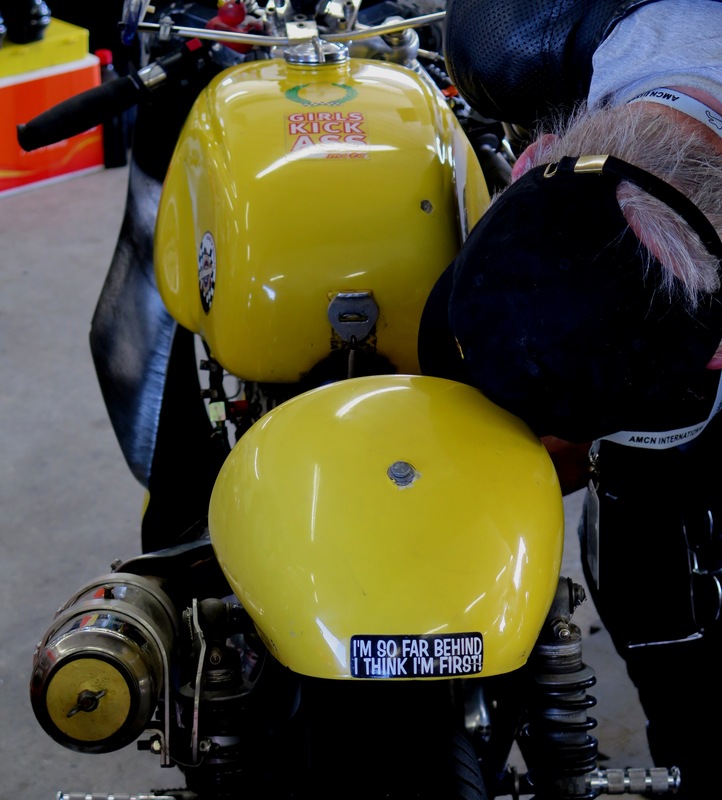 I am especially pleased to meet the demigod himself, John Somerville, the Bultaco Metralla restoration specialist. 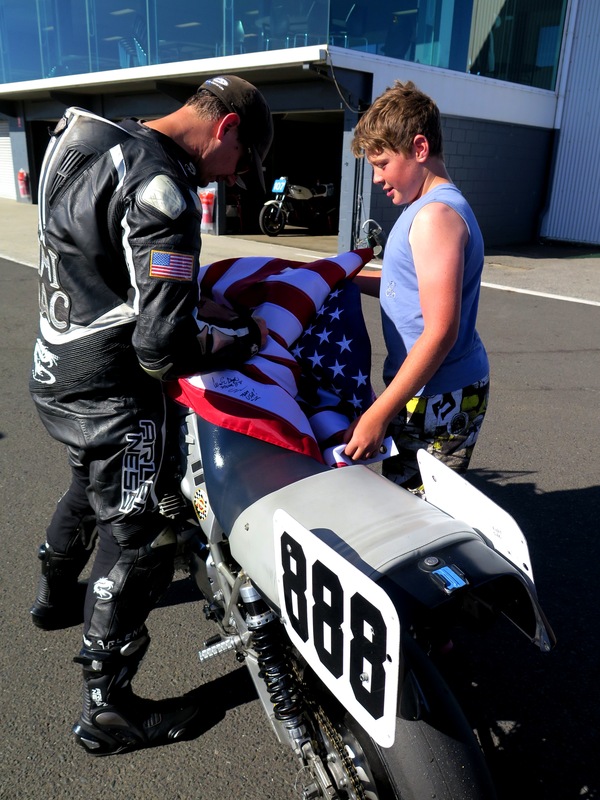 Gregarious and gracious, he spent much time explaining the racing bits on the bike he found me admiring. Helpful tips for my Metralla racer. 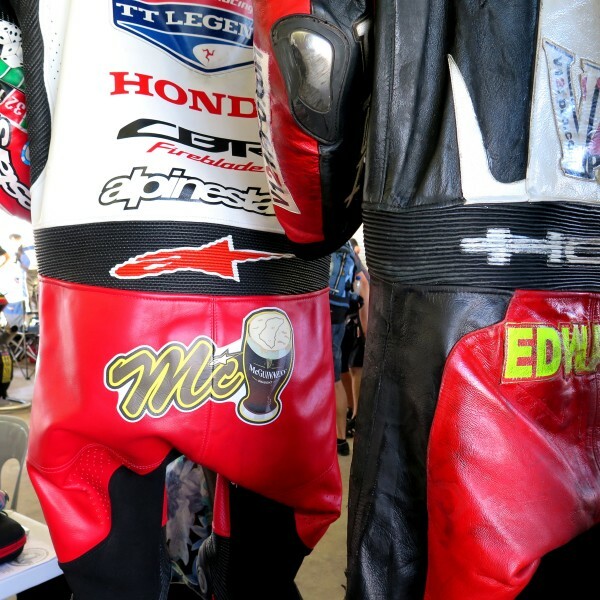 Impressive was the level of detail and pride at which most of the Australian and New Zealand motorcycle owners had prepared their racers. Polished jewels and quite fast. 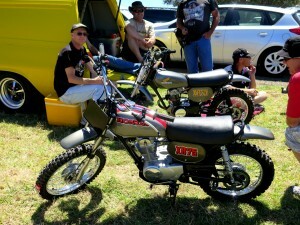 Classic racing is serious business “down under”. 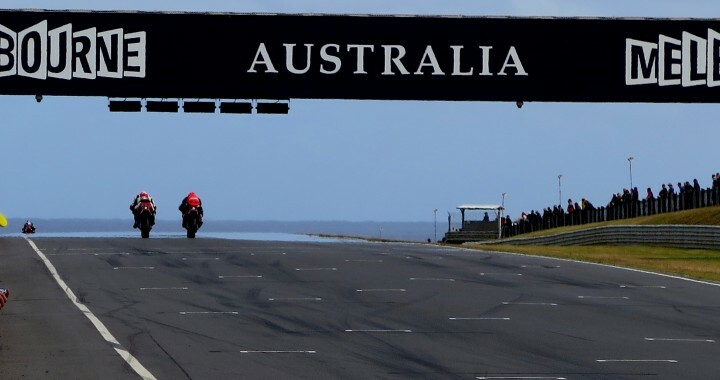 Classic racing in Australia, New Zealand, as well as in Europe. 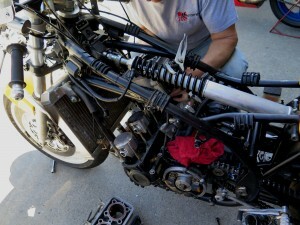 Bike preparation is generally at a much higher level by comparison to the American classic race bikes I have seen. 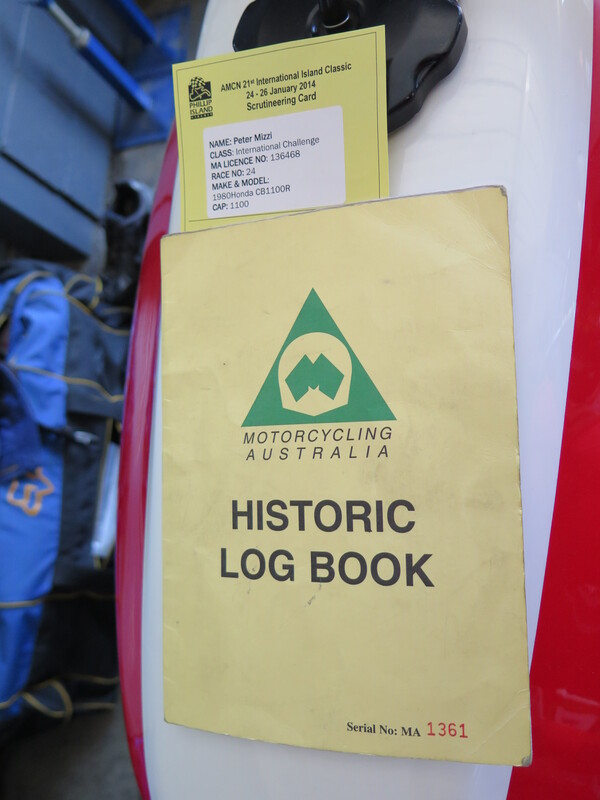 Their race clubs require motorcycles to keep stamped registered log books, which include photos. 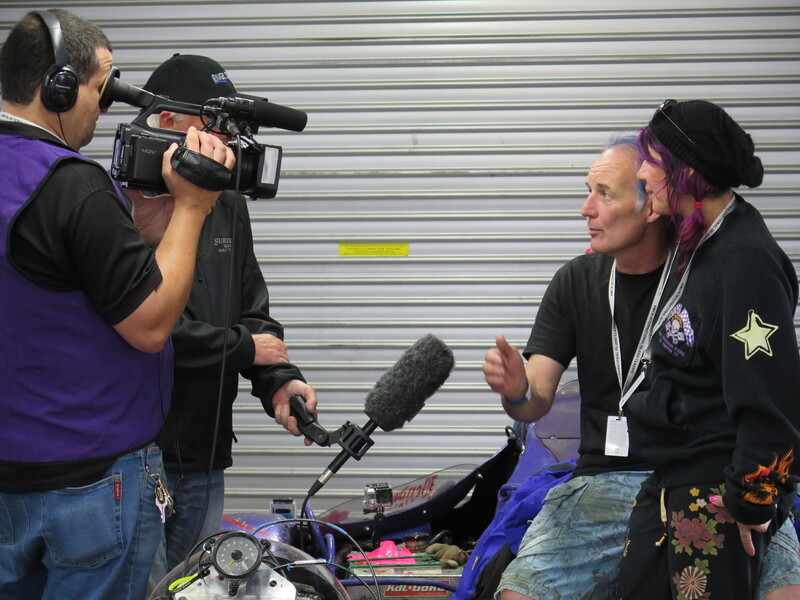 We could learn much from the racers “down under”. 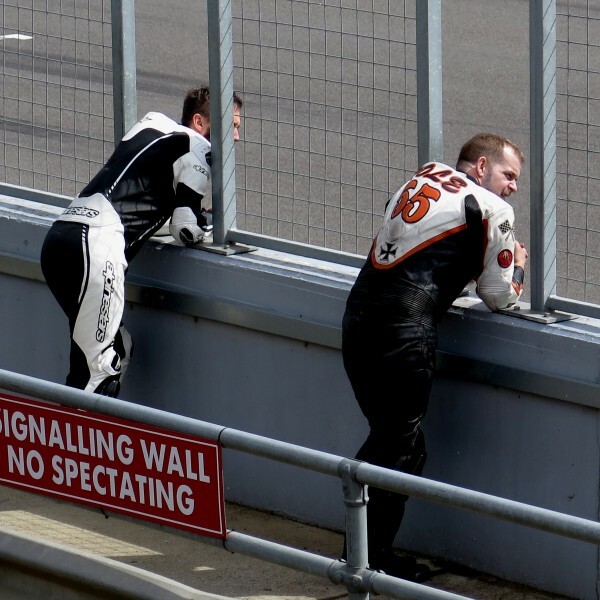 They take motorsports racing much more seriously, and to much higher standards. 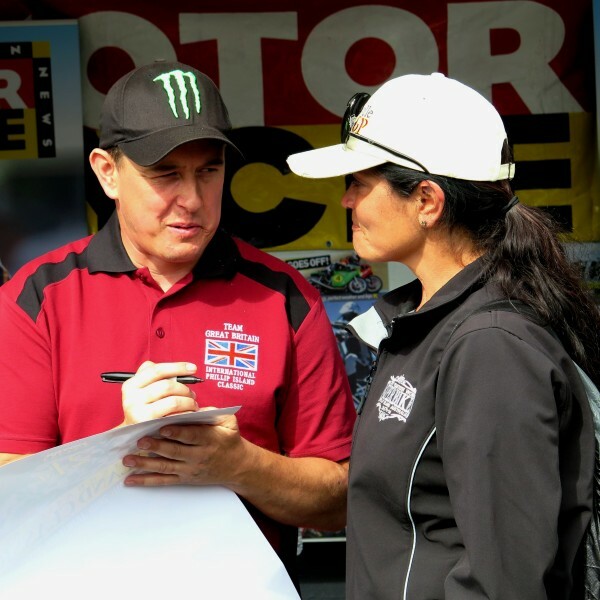 Same applies to the attention they place on race safety and program guidelines that cover all disciplines of motorsports racing throughout their country. 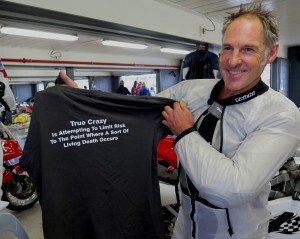 As every country should regardless of whether it is professional or amateur level racing. The United States has only one state that takes motorsports racing seriously, New Jersey. They have passed legislation governing safety in all state motorsports parks and the different types of racing events. Where are your fast guys? I get asked this question from more than one spectator over the three-day event after recognizing my Californian accent. It would start with “Are you a “Yank”? Then “Who are you with?” Followed by “Where are your fast guys?”. I defended and explained that the racers on our team are not professionals but amateur club racers. Some retired pro’s, yes, but typically from the 80’s and 90’s. 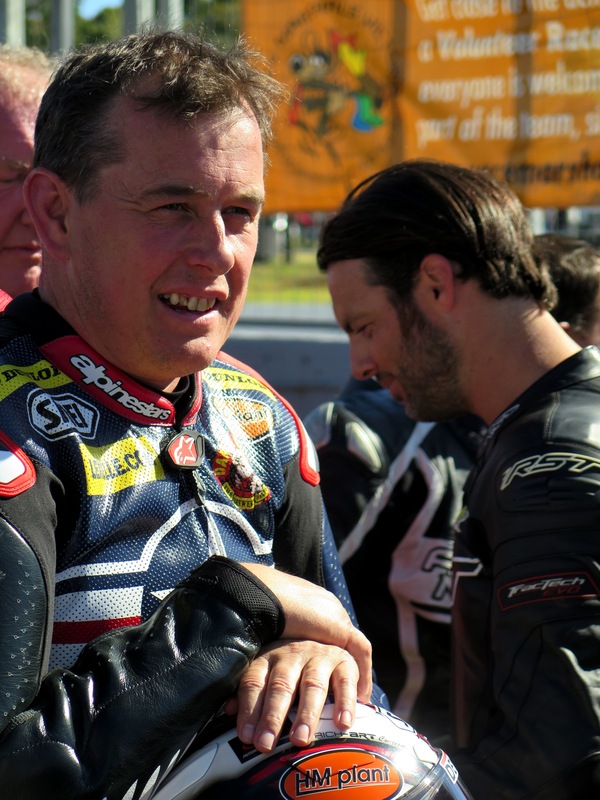 I also explain we do have faster national amateur and pro racers but for some reason they were not invited. In fact, I would be surprised if any were aware of the event. 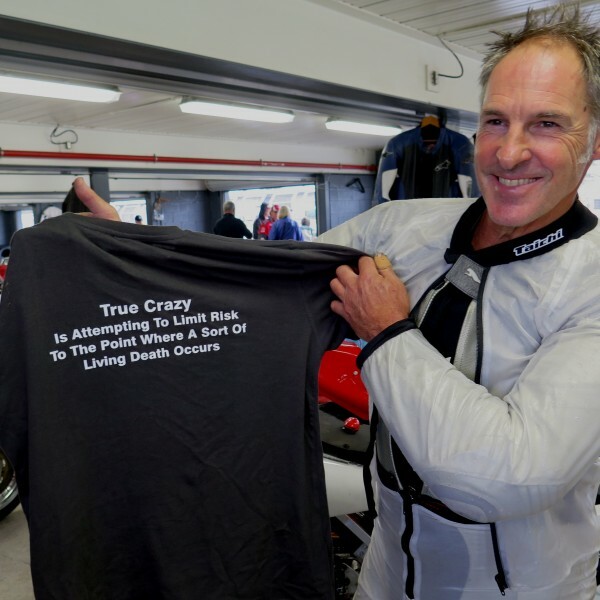 For some reason it wasn’t publicized via normal American motorcycle racing media, printed or online. 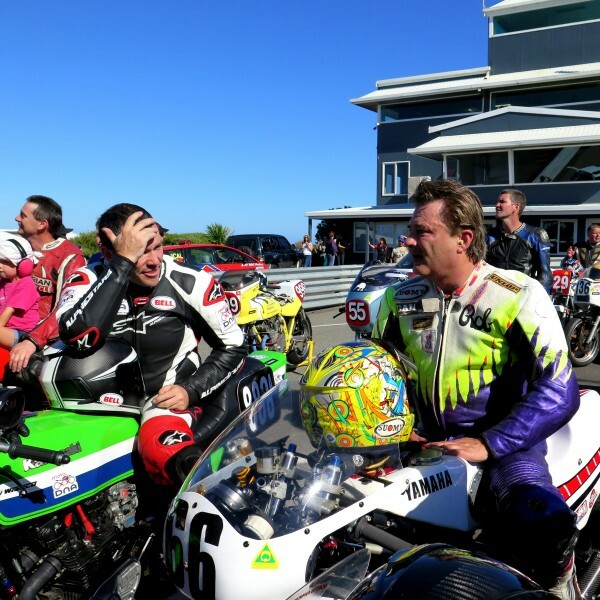 Schwantz and Spencer? Their replies were of disappointment when I explained who was here. One went so far to say “Do you think that is fair to us as spectators? We came to see a show. 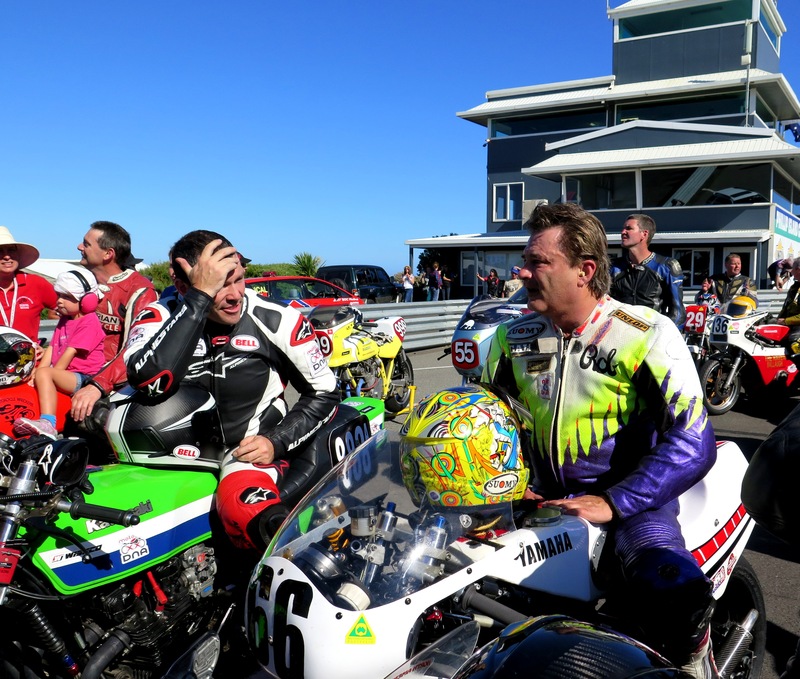 We were expecting to see your fast guys!” I asked one fellow, “Like whom?” He replied, “Schwantz and Spencer!” I thought to myself, those guys would come only if you pay them. And it would only be parade laps, not actual racing. This conversation happened one too many times over the course of the weekend. I had to admit that I was starting to feel a little embarrassed and sorry for the American team as I defended them. Outclassed in the Premier and Main class by the professionals and their machinery in every way. 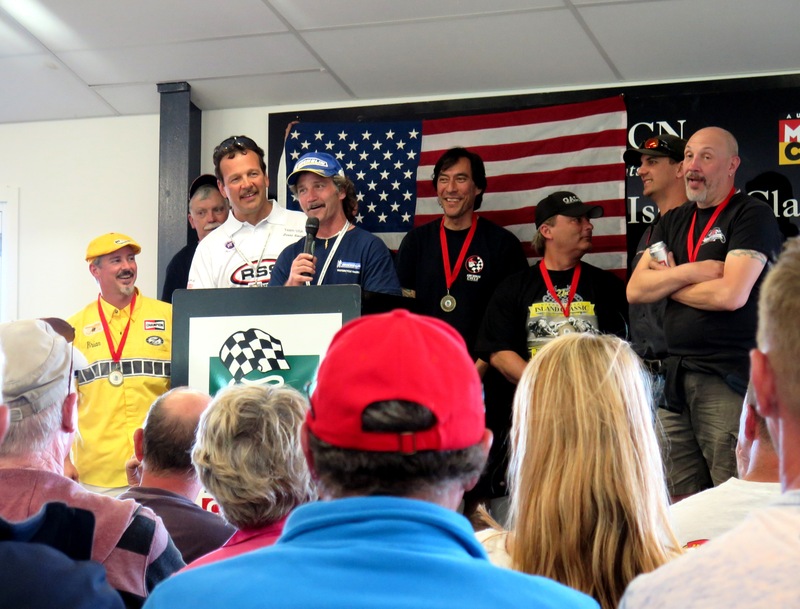 But in true American fashion, many of our racers were competitive, and “scrappers” putting up a good fight. Especially when it came to non-main race classes. Go JimmyMac! Our best U.S. finisher for the main race, called the International Challenge, was Californian James “Jimmy Mac” McKay. 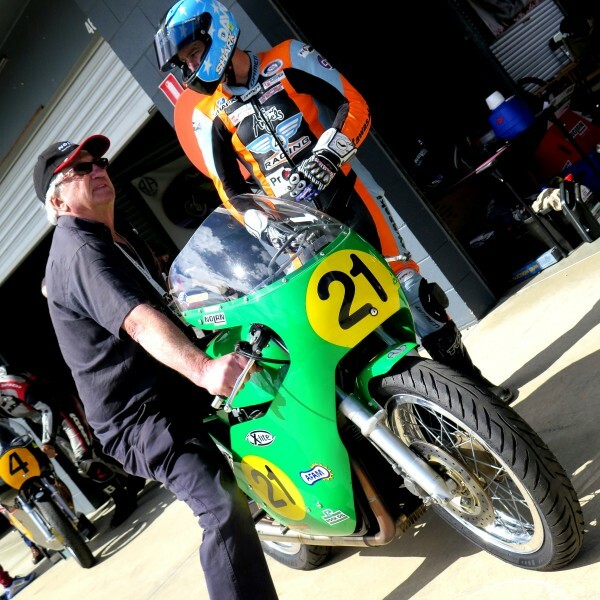 He originally came to race one of the several classic race bikes that American organizer Dave Crussell had brought, a Kawasaki Z1R. However, Crussell’s bike arrived to Australia not quite “race ready”. 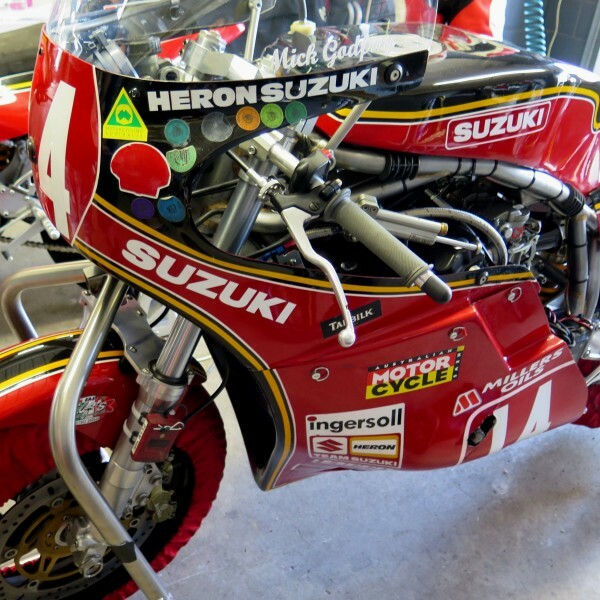 So instead Jimmy borrowed a Suzuki Katana, a back-up race bike from another American racer. With a little practice he managed to place 13th out of 37. He placed 9th in the Premier Class. 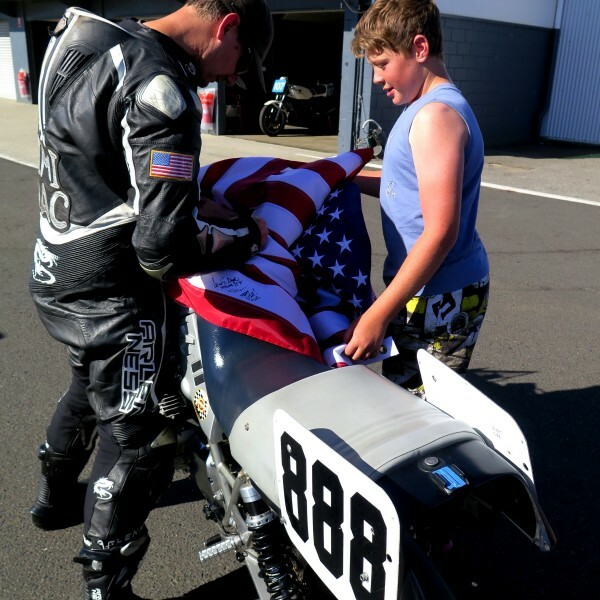 However our best American combined points total for the Classic races both days, was from Rob Mesa, 16th out of 20. Team point standings get tallied by country. Adding up all the Challenge racers results over the two days. The total overall points breakdown accumulated by total number of racers for the Premier event was: Australians (10 racers) =1161pts, USA (10 racers) =491pts, UK (9 racers)=916pts and NZ (8-racers)=553pts. 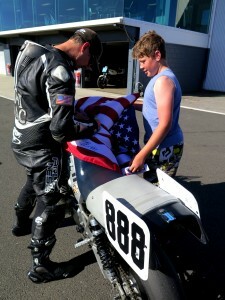 The US who had just as many racers as the Australians, but unfortunately accrued less than half of their total points. An example of just how out-classed they were for the main races. 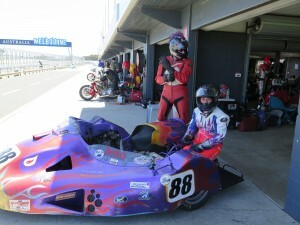 We won the Sidecar Race! 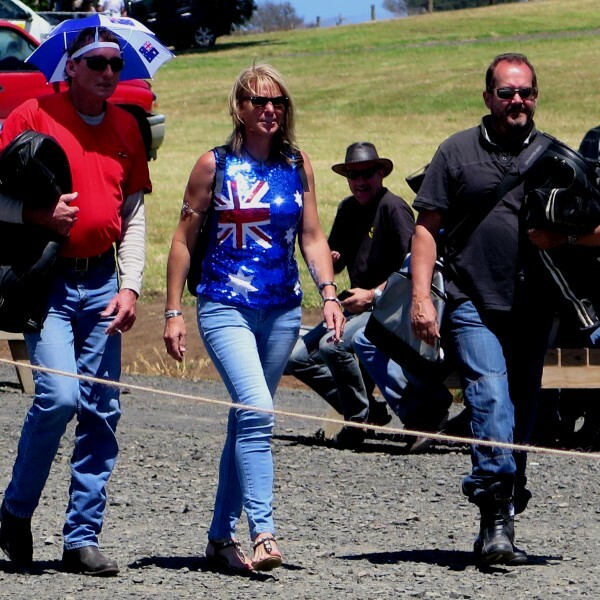 There was one winning American team from Northern California, Wade Boyd and Cristine Blunck . These two were crazy cracking fast! 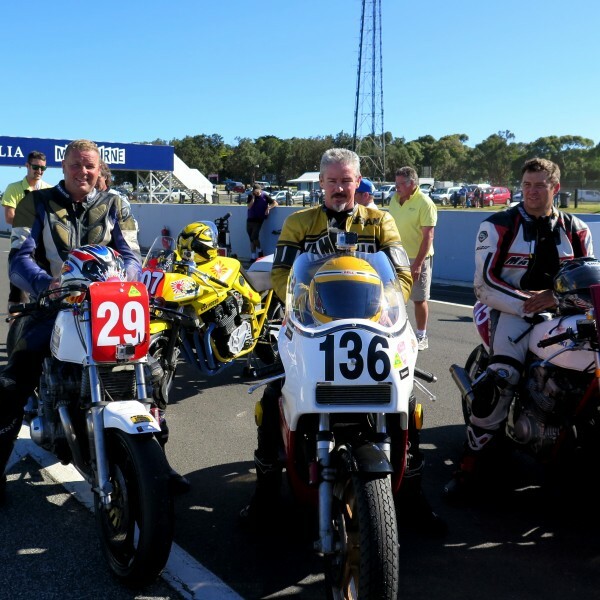 Getting 1st and 2nd place on a 2006 Suzuki Sidecar at Phillip Island would have to be! 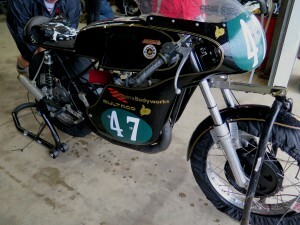 Others who made top 10 finishes: Brian Filo managed an 8th and 10th on his 1972 Yamaha XS750. 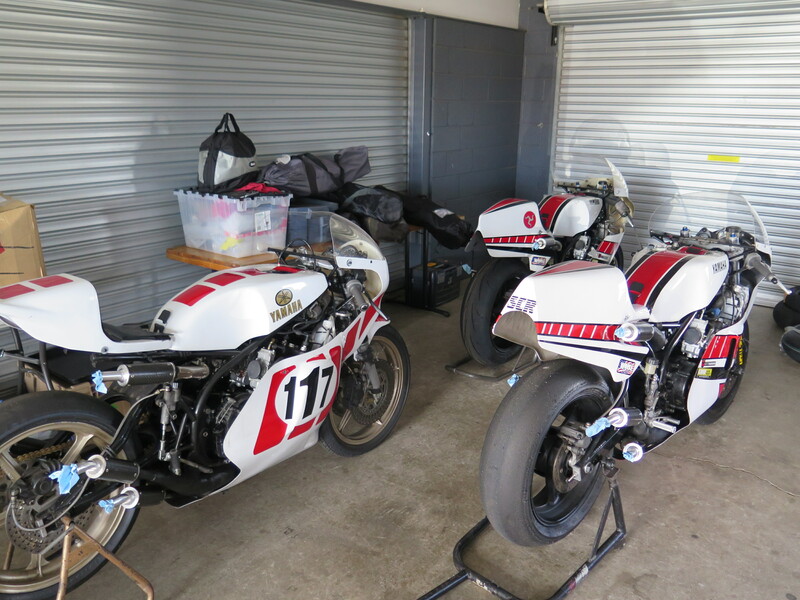 Dave Roper was working hard over the weekend on his 1975 Honda CBF500 with a pair of 4th’s, and a 7th place on his 1962 HD Aermacchi 350. 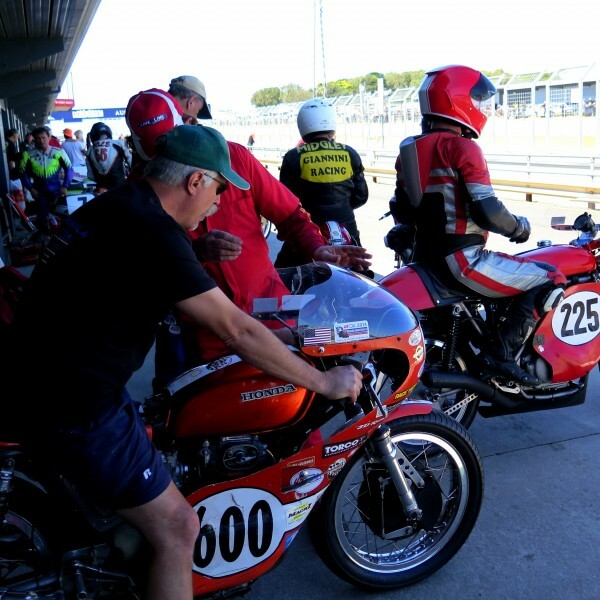 Some more 350 racers were Timothy Tilghman placing 5th, 6th and 7th on his 1971 Honda CB350. Bob Demetrius got 8th, and Richard Midgley earned two 10th places also on Honda CB350’s. 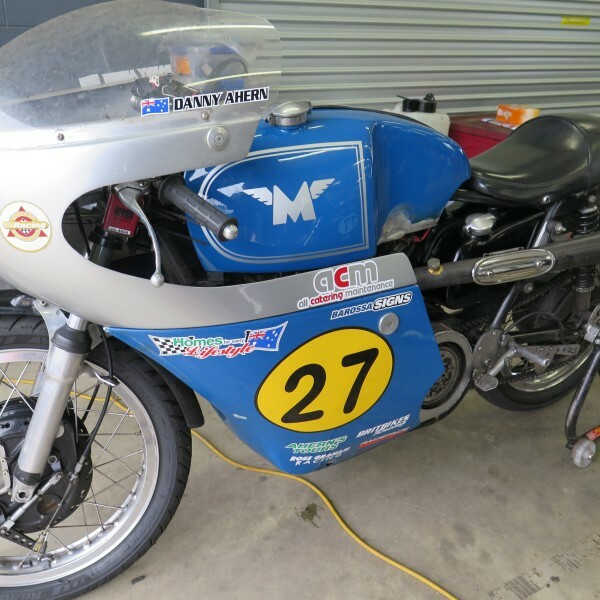 Small displacement rocketeers were Erik Neilsen, 4th and 5th on his “very special” 1965 Honda CB175, and Jon Munns came 8th on his Honda CB200. Qualifying and proper bike preparation would help. However, there were certainly some racers that maybe should have not taken a spot in the American container. One racer admitted she was afraid to race her Ducati 250 single which sported a sticker “ I am so far behind I think I’m first! Sadly, she was lapped. 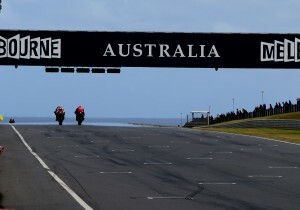 Phillip Island is not for the faint of heart. 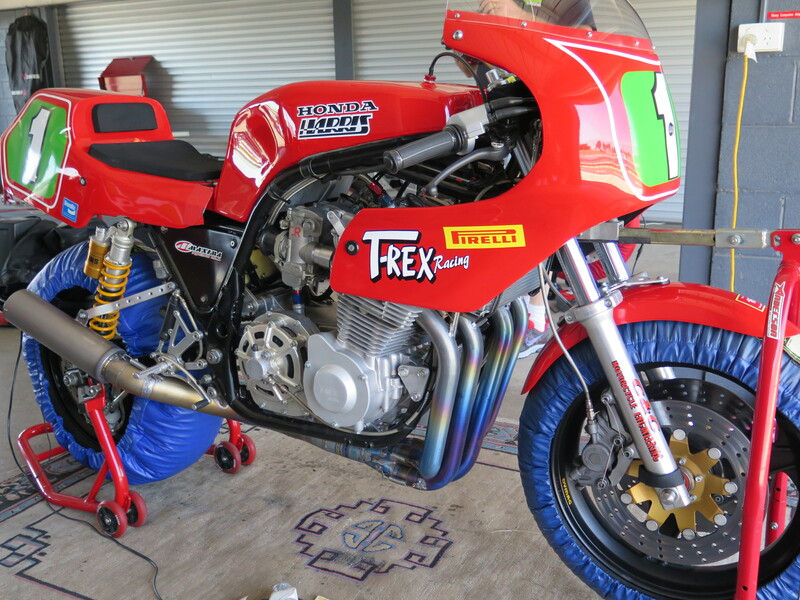 A very long way to travel without a properly prepped and tested race bike. It eats engines for breakfast! Post race celebration. Racing ended and the boasting began by the British and the Aussies during the awards ceremony. It was entertaining and playful. 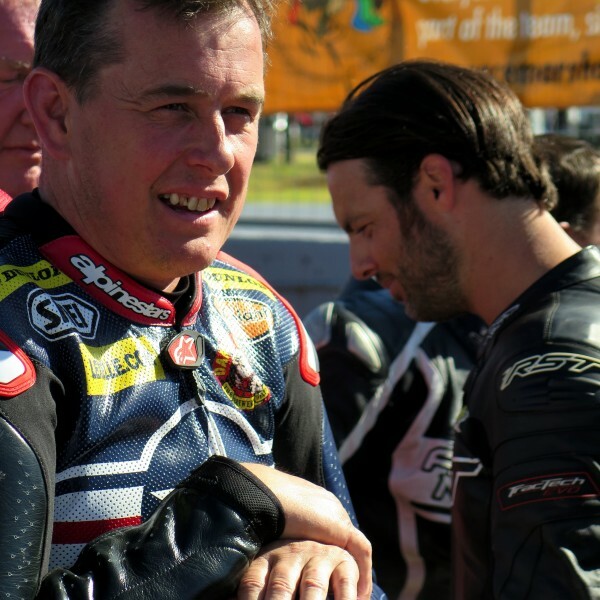 John McGuinness telling stories about what it was like to race with the now deceased Joey Dunlop was especially memorable. The American team captain received a royal roasting by a quick-witted and silver-tongued presenter, journalist Alan Cathcart, who showed little mercy. The team captain was ridiculed for being late to the awards event. Team USA became part of the entertainment factor. 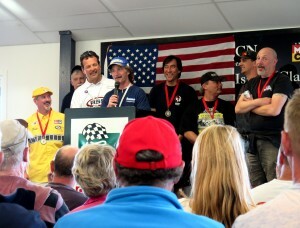 The awards ceremony was a popular and sold out event with many racers and spectators attending. Open invitations please. Overall the event was an amazing and worthwhile trip, as well as an eye-opener on many levels. 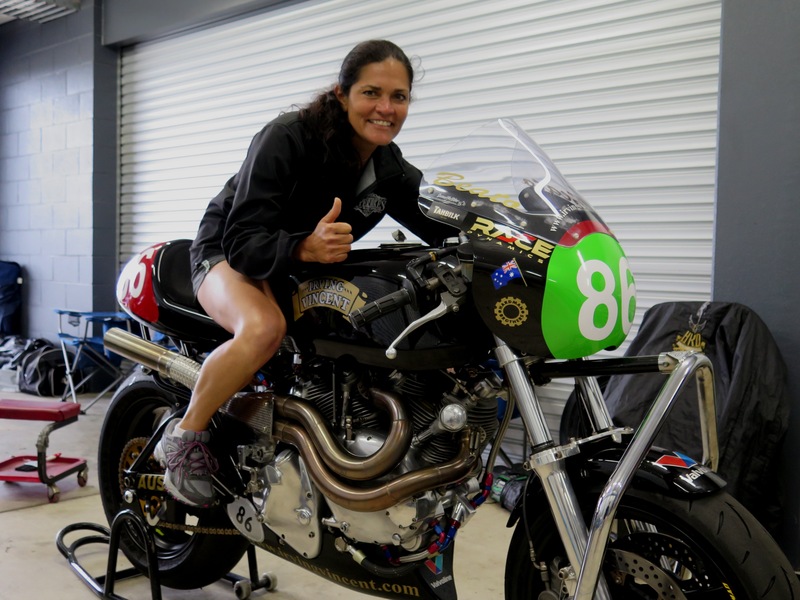 Great race bikes, mechanics, racers, spectators, stories, venue and most important new friends. 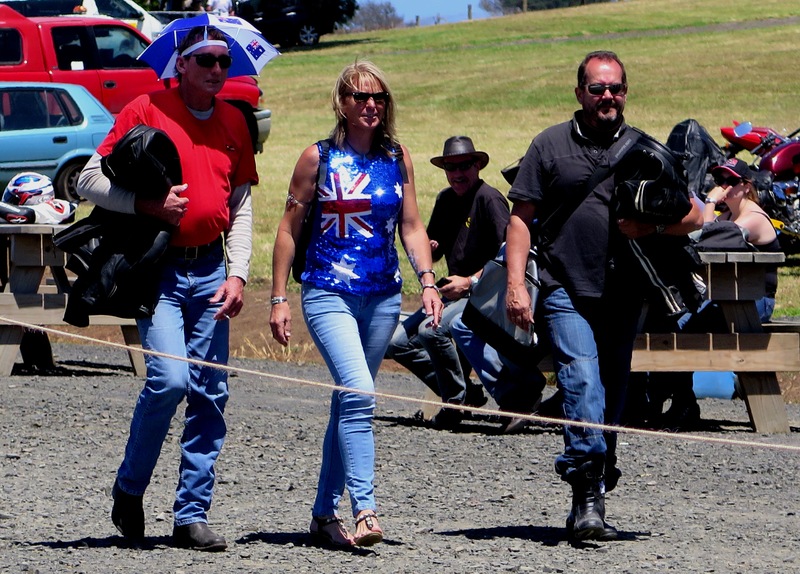 I learned clearly classic racing is serious business and popular entertainment in Australia and New Zealand. Just as I had experienced in Europe. 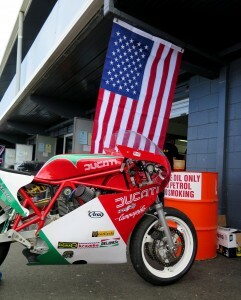 So it leaves me to wonder why not invite our American road racing best? 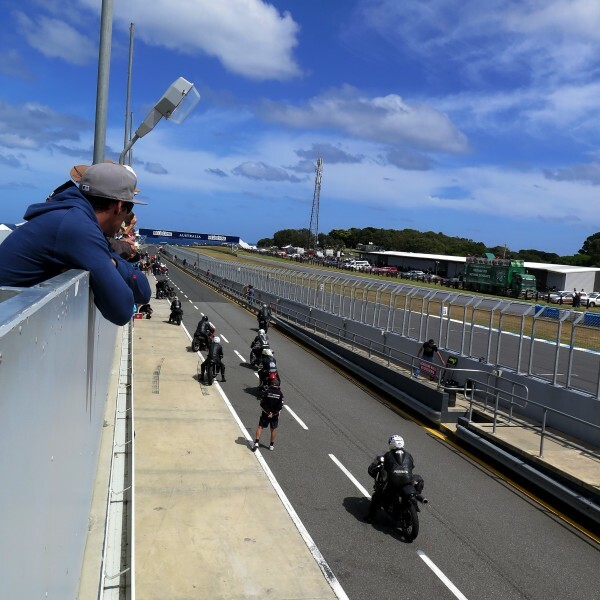 There is plenty of American experienced road racing talent from American clubs and professional racing associations that would love to race Australia’s most amazing race track. The U.S.A can be just as competitive, earn more podiums, for the much-needed points! 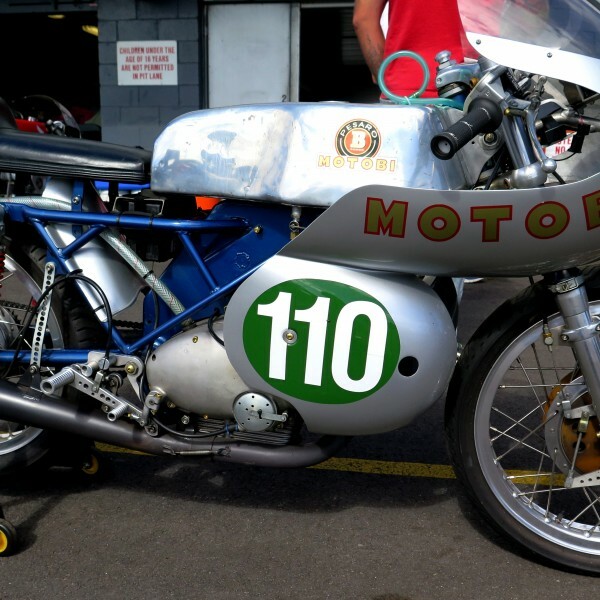 Many collectors who own eligible race bikes would also love the opportunity to break them out for an international event of this caliber. The provenance would increase their bike’s value. The free bike transportation is quite costly and very generous on the part of the Australian organizers, but how long will that last? If advertised early and nationally we could give the spectators what they really want, an international show! We do have “fast guys and gals”! We can compete with their best and make it a “win-win-win” for the sport of classic racing overall. 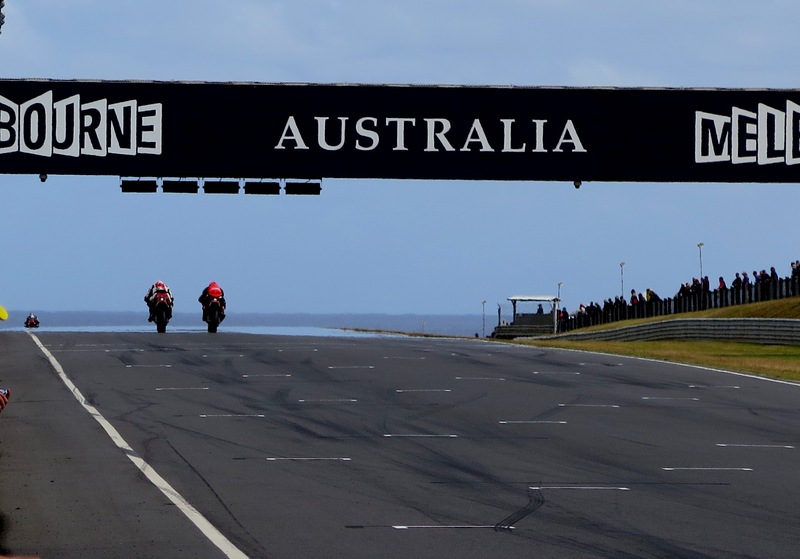 January is an off-season cold month for American road racing and summertime in Australia, no real schedule conflicts. So help spread the word and let’s show them we’ve got pride, and some go fast pro’s of our own!!! ← The Indian Scout 60 and RSD Magic!